A year ago we traded our dining room in for a larger kitchen. If you missed the posts you can find them at Kitchen Remodeling, Expanding the Kitchen and Adding the Header. While expanding the kitchen was a huge improvement it also left us without a place for our modem and router. Our old computer and desk were located in the dining room and they were the first things to go before tearing out the wall. But that left us a modem and router with no home. The only solution was to move them to the opposite side of the wall, right next to the fireplace. 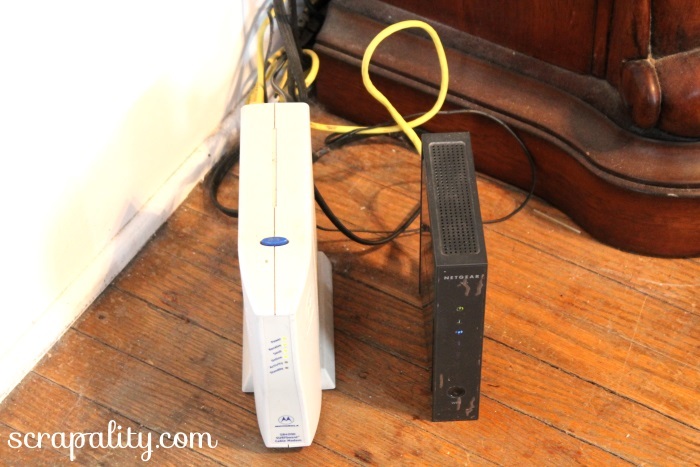 After we mounted the TV above the fireplace I really wasn’t happy with the modem and router on top. So to the floor they go. But, again there’s another problem. They’re sitting on the floor with wires exposed. I headed to the basement and grabbed some junk. I grabbed an old crate, old books and a few other spare items laying around and arranged the crate to hide the wires and display the junk. 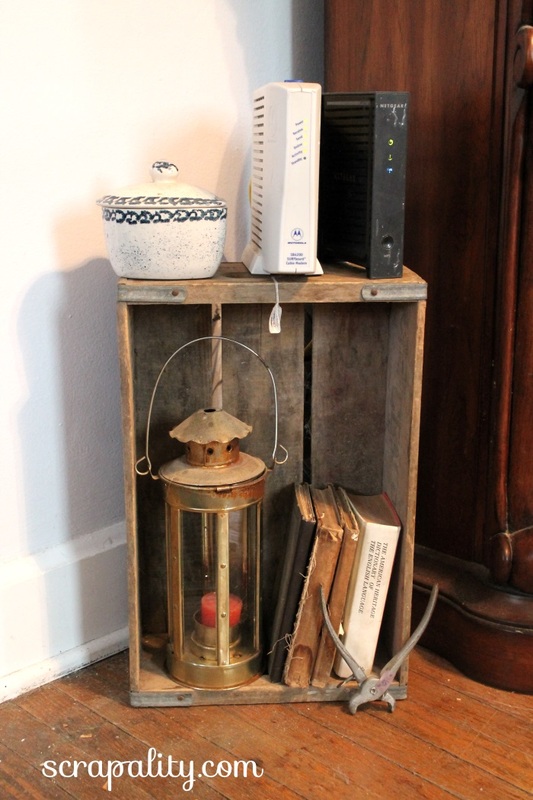 The crate keeps the modem and router off the floor plus displays some of my favorite junk items. Over the last few weeks I’ve been super busy with a few projects around the house. I can’t wait to share them with you. Stay tuned. I’m sharing this junk project with a few amazing parties. LOVE this idea – I have a few crates that I’m using in my kitchen, but this would be a great repurpose. Those little LED lights on modems and such are so bothersome and this is an ingenious way to disguise them. Thanks for the awesome idea! Wonderfully styled junk! Thank you for sharing on the Brag About It link party! This is such a great idea how to hide those things! Mine are sitting under our tv right now and I think have the perfect junk to disguise them! Thanks for the idea! Yes, it’s a very small price tag. I use my junk to hide the rest of my junk. I do have an old primitive jelly cupboard and whatever TV we have it must fit in the cupboard. Brilliant!!!! Thanks for linking it up at the Motivational Monday link party last week – hope you’ll join us again this week! PS – I’m featuring you in next week’s party!! YAY! Great idea! I’ve also used an old door. Just hate those cords! lol! Thanks for sharing with SYC. Love this idea! Thank you for sharing it on Show Me Saturday!